Look what I found in my mailbox a few days ago! New fall pillow covers! If you have been reading StoneGable for any length of time you will know that I have a love affair with pillows! 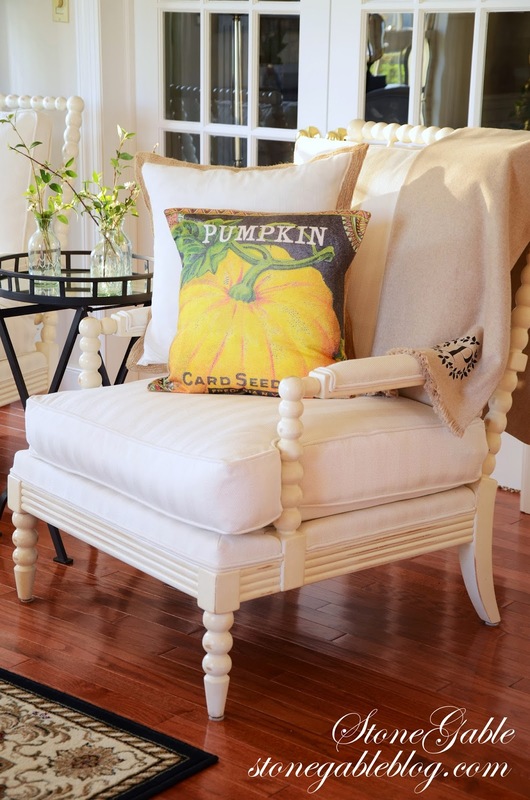 But the pumpkin pillow preferred the living room and settled into one of my “bubble” chairs! 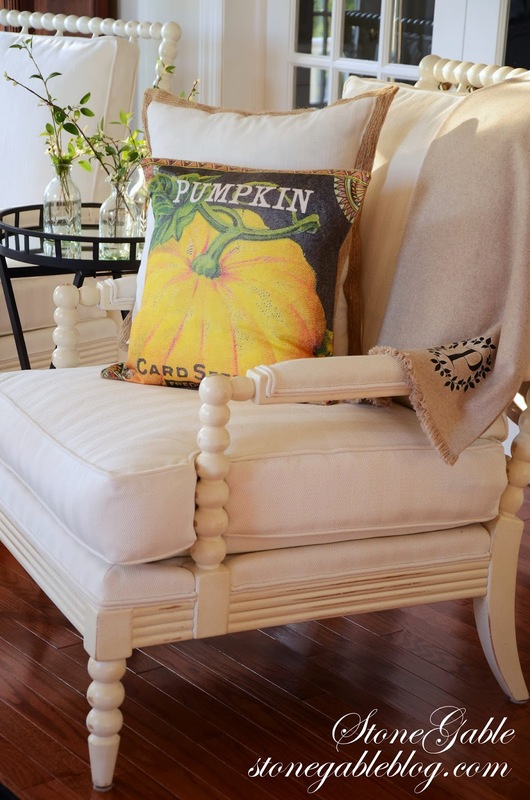 The pillows came from ELLIOT HEATH DESIGNS, makers of vintage inspired burlap and pillow covers. They are beautifully made. Worth the money! The second fall pillow found a home on my white family room sofa. 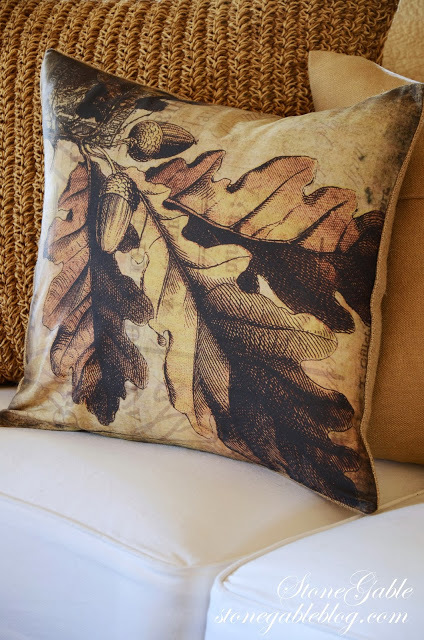 I am just wild over the oak leaf and acorn design! 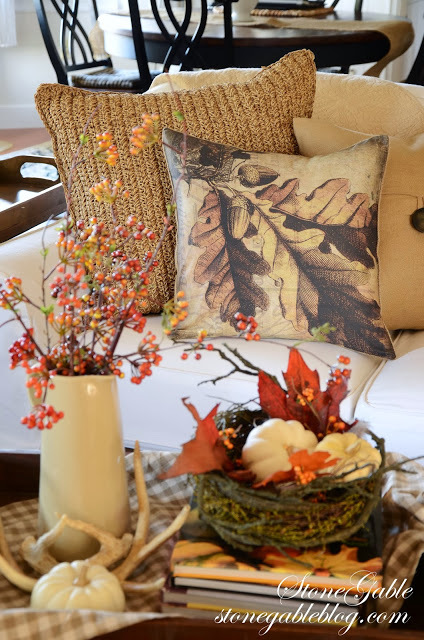 I mixed the fall pillow with a woven jute and linen pillow… all in warm leafy oak tones. 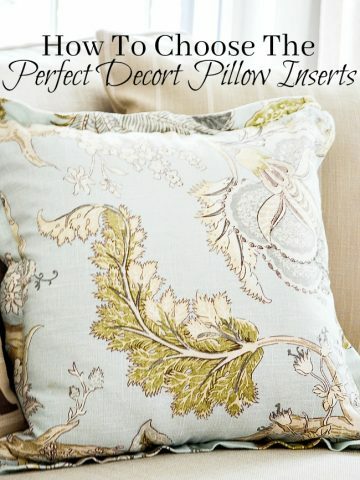 I so much prefer pillow covers and inserts over pillows that are sown closed. When the season is over I can remove the pillow cover, launder it and tuck it into a drawer along with all my other pillow covers. I have one more pillow cover to show off, but not until closer to Christmas! Thanks so much for showing these pillow and this site. I just ordered me I love for fall. Always enjoy your posts. 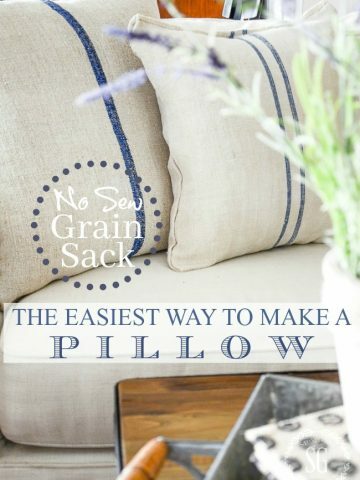 I love pillows too but what do you do with them when someone sits down and they’re in the way? They often end up sat on and scrunched or on the floor. I’d love any advice you have about that issue. Thank you! I’ll be doing a post on this later this month. Look for “Pillow Etiquette”. Can’t wait to see the post on pillow etiquette. Love the pillows. Had to go to Elliot Heath Designs. Pillows are fabulous. Thank you. Both are gorgepus but I LOOOOVE the leaf and acorn one! SOOOO pretty and love the woven one behind it! 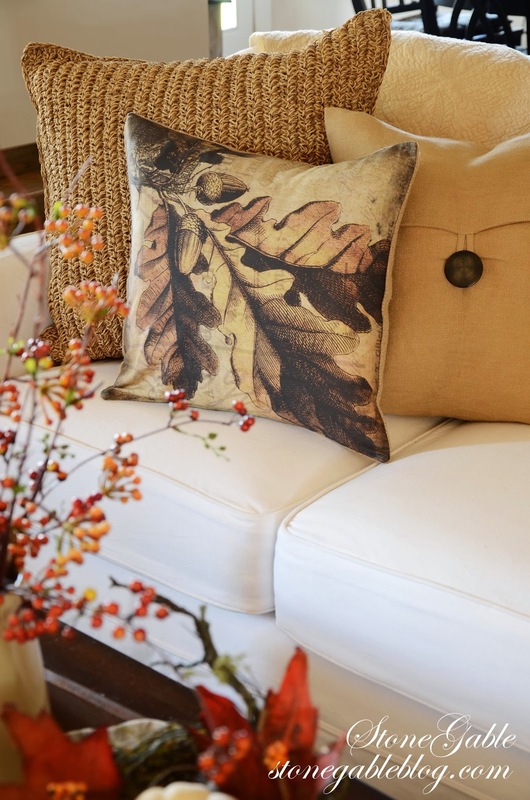 I love autumn pillows like this that aren’t “overt” in their design. These are so subtle in their beauty but still convey that autumn feeling. I would just love to have the acorn one for a couple of rooms here at home! Pretty, pretty! Love the pillows! Makes me drool! What happened to At Home? It’s disappeared. Gorgeous pillows Yvonne…will have to check out that site! 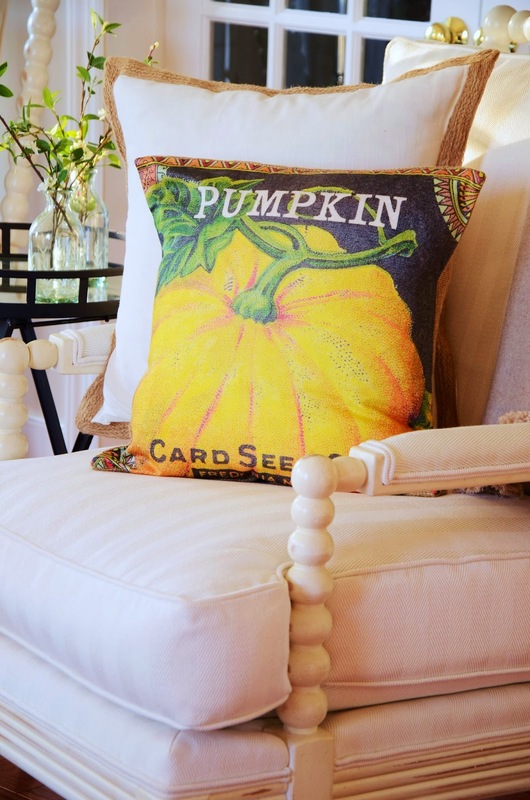 Love the pumpkin pillow – so cute! 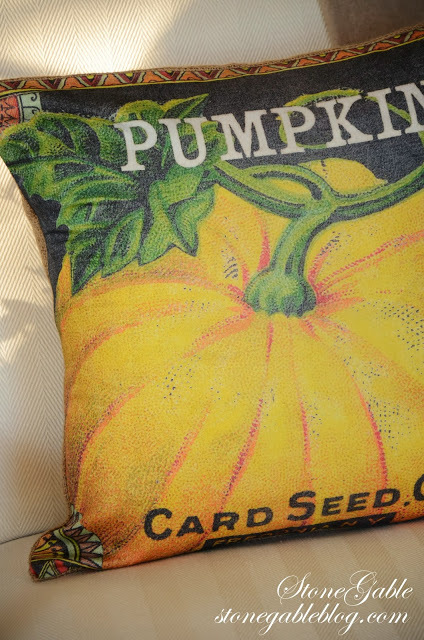 I love pumpkins and absolutely adore the pumpkin pillow! I think I see a Christmas Santa I’d enjoy! Thanks for the post and link! I love pillows, they so make a statement and is the perfect accent for any decor when we want to change a season, or make a theme party. I love them Ivonne. The just right addition to get you in the mood for fall! Gorgeous pillows! And I LOVE that bubble chair! So unique and pretty. It’s amazing what a difference pillows can make. I’m in the process of redoing my patio and I think I need to add several more pillows to the loveseat and chairs out there. 🙂 I recently discovered your blog, and I love it! Such a beautiful home! I love pillows too. You can change your home decoration with a little bit of fabric, wonderful! 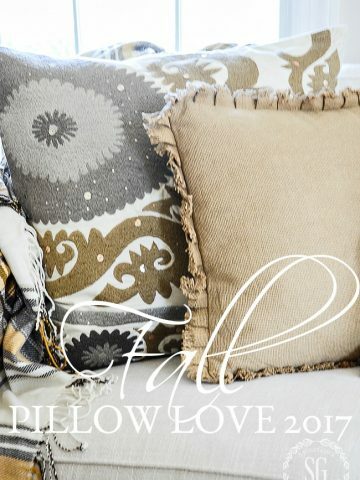 Love all your pillows….Pillows just give that extra punch to decorating and so easy to switch out for a seasonal change! Love all your decorating ideas! 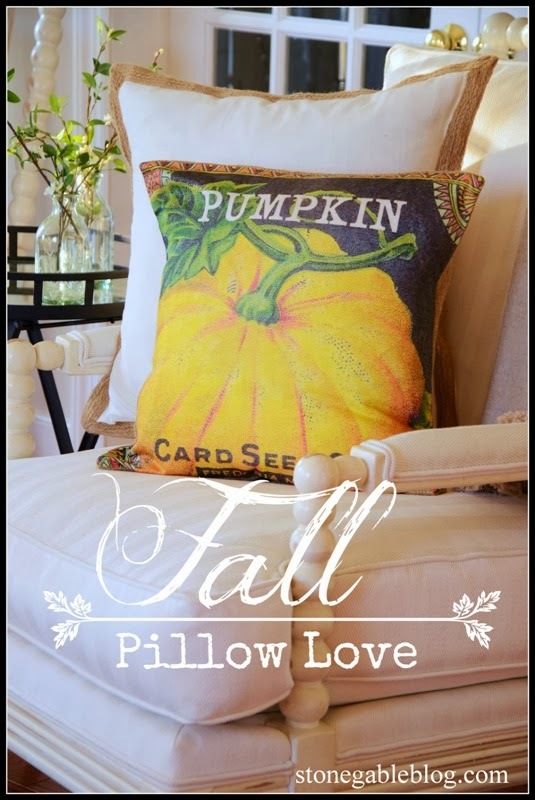 I love the graphics on your pillows, especially the pumpkin one. The black background is quite pretty on top of the white chair . . . and grounds the vignette. Love them! The pumpkin seed pack one looks like the graphic currently on the Graphic Fairy’s blog. That leaf pillow sent to you has my heart. 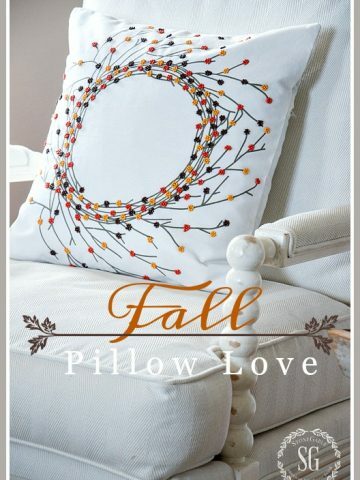 I think it is the prettiest pillow for Fall! Those are beautiful! I have always loved vintage seed pack illustrations and this is such a creative way to display them! They are the perfect fall touch in your gorgeous home! Oh Yvonne these are gorgeous for Autumn! I am on my way to check the site, as one pillow nut, I cannot have too many! Beautiful! It’s know wonder you purchased them!! What great pillows. They both look just right on the chair and the lounge. I love it, the pumpkin one and the leaf one. You have such a great eye for finding beautiful things.